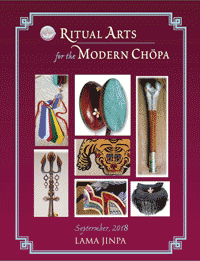 WE PIONEERED THE RETURN TO authentic Chod Damaru and Vajrayana implements over 10 years ago! These damaru are made by our Bhutanese fabricator in his small workshop according to ancient traditional methods and artistic integrity. With trees from Bhutan (one per drum) and untreated Bhutanese goat skins, their powerful energetic and spiritual effects have the ability to dramatically improve our practice and to benefit towards others. Supporting their creation also assures that the science of these tantric Chod instruments of Tibet, Nepal and Bhutan will not be lost. Bone implements, bells and other items are also sourced out in Nepal and Bhutan, as needed. All items are CUSTOM FABRICATED or custom ordered on request. This includes SengDeng Chod Damaru from 8″ to 10″ in diameter. Zabshing (Bawa) Damaru are super light weight, made of the burl of the same tree, but do cost more. Please contact us with your request and for current prices, as they fluctuate. Occasionally we receive special or extra items; these will be listed here on a monthly basis. We pioneered the return to authentic damaru in the West. Authentic damaru are a direct channel to the spiritual power of the dakini, yidam, protector. Stiff brocade cases. Treated with beeswax as a moisture barrier. Traditional wood (shing) sengdeng Chod kangling. Safe for travel, airports, public graveyards. For wrathful yidam practice, such as Dorje Phurba, Mahakala, etc. Natural disk thickness of 12 to 13 mm produces 12 or 13 inch mala. Made according to correct vajrayana traditions. Special TangTong Gyalpo statues are back! Available in small, medium or large size with copper case. Contact us directly for details, availability and price. From Bhutan, Brahmin or Tamang Buddhist of Nepal. Bare bone, can be coated with beeswax, etc. Availability is limited and variable. Please enquire!